With general admission prices ranging from $20 to $100 or more per person for a day's fun, it's no surprise that travelers often look for ways to save money on amusement park tickets. Finding discounts on tickets can help you enjoy a great theme park getaway on a budget. Following a few key tips will help you get the best offers available and make the most of your vacation budget! Theme and amusement parks and attractions are independent businesses and set the pricing that is based on multiple factors that include pricing of their competitors (areas with more attractions in a smaller region such as Southern California and Orlando watch each other's pricing constantly), the variety of offerings at their location (how many rides, shows, and games, for example), popularity of their park, and attendance. This sometimes translates to opportunities to score good ticket prices. The key to getting the best deal lies with taking the time to investigate the variety of discount opportunities that may be available. Check the park or attraction's official website first to see what direct-purchase deals may be available and to gauge the initial price. Many locations offer discounts for tickets purchased online and printed at home or that can be transferred to a mobile device for admission. If you make your plans well in advance, you may be able to purchase tickets earlier that will have a greater discount than if you wait until close to your travel date. Sometimes you will find additional deals or offerings that are not always publicized, such as early admission to the park or an exclusive option for a special event of some type, so there can be some great advantages to purchasing in that manner. See if the park you are interested in visiting has a calendar or some type of event sheet, as some locations use dynamic pricing as a way to encourage people to come on days when they usually experience lower attendance. For example, off-season ticket prices may be lower than during high season. Some parks will offer discounted ticket prices if you are willing to enter at a later time in the day, something akin to a twilight evening ticket. This has become a practice for many regional parks, in particular, so be sure to look for those deals. Most major parks regularly offer coupons for cheap tickets. Depending on the base ticket price, coupons may cut $1 to $10 off per ticket, or there may be deals such as buy one ticket get one free, buy an adult ticket and get a child's ticket free, or other price reductions. Coupons can often be found on soda cans, snack food packages, in local travel or park brochures, or from fast food restaurants. These offers will usually show up starting in March as families are planning for summer vacation time. Discount sites like Groupon and Living Social will occasionally have discount tickets available, so check there as well. Verify any restrictions before purchase as often those offers can be limited to certain times and dates. Some amusement parks arrange promotional offers with sponsoring businesses that can lead to cheap tickets for park guests. Radio stations may give away free tickets, and schools, credit unions, and grocery stores often sell discounted tickets. TV stations may sponsor specific deals such as date nights or family pack offers, or early and late season tickets may be offered at special promotional rates. Promotions will most likely be seen and heard in local area in proximity to the park or attraction. Consider going online and checking out local radio and television stations to see if they have promotions listed. Many parks are now offering special discounts for local residents, too, so if you are interested in having a staycation, family and friends are coming to visit, or you want to have a little weekend getaway that is pocket-friendly, be on the lookout for these promotions. They are often announced in media advertisements as well as the park's website. You will have to show your driver's license to verify you live within the identified region, but it can save you a good deal of cash on the entry price. Most amusement parks offer season passes that can be the cheapest deals of all for guests who plan to visit frequently during the season. While a season pass is generally far more expensive than an individual ticket, if the passholder visits the park three or four times during the season, it pays for itself and more. Many parks also offer additional incentives to passholders, such as merchandise and dining discounts and other coupons for even greater savings. If you have an annual pass associated with a group of parks, such as Six Flags, it may extend to admission for sister parks or be shown to provide a further reduced ticket entry price. Check before you travel to know if you can take advantage of that opportunity and savings. You may be able to purchase cheap amusement park tickets because of their personal affiliations. Be sure to check the park or attraction website frequently as often they will have banner ads that show what current discounts are in play. Senior citizens and children under a certain age or height, for example, often qualify for less expensive tickets. Discounts are also often made available through organizations such as AARP, AAA, Costco, and Sam's Club, all to which membership is required to take advantage of any special discounts. Credit unions are also a good place to ask about discounts as many will also provide. Military personnel will often receive a discount if they present proper identification. Check first to see if that is indeed an offer and if the discount extends to additional party members or just the servicemember. Some organizations, such as Boy Scouts, Girls Scouts, and Campfire will have special celebrations days that will have pre-sale tickets available through the organization. Your company may qualify for a group such as Working Advantage or Tickets at Work that offers many of the same discounts available through other membership organizations. If you happen to know someone who works at a park, particularly a park that may be affiliated with others, see if they have option of purchasing tickets at an employee discounted rate. Be advised that the employee may need to be with you for the tickets to be valid. Group purchases are typically discounted as well. If you have a large group that would like to have a day at the park, you may be able to enjoy a significant discount on each ticket. Check the park's website or speak to someone in the group sales office. Group discounts are often available for schools, corporate groups, nonprofit organizations, birthday parties and more. If you are looking to take a vacation, you may want to check into packages provided either by the location or neighboring hotels. Many have great programs that not only offer reduced hotel stay rates, but reduced rate tickets as well. These packages sometimes include special early or late hours reserved for those who staying at specified locations, meal packages, rental car or transportation, product discounts, and/or access to other exclusive offers and deals. Go to the park or attraction's official website for additional information and associated hotels that are working directly with the property. Many parks have additional properties that are part of their organization (think Walt Disney World Resorts with multiple parks) or cooperate with other attractions in their region to offer specialty deals. These deals may include tickets that are good for multi-day entry, add-ons such as waterparks, or a ticket that permits entrance to a variety of locations. Purchasing tickets of this nature can offer great flexibility to your plans at a far better rate than purchasing individually. Caution: Ticket usage policies are constantly changing, so be on the alert. Be sure you understand the ticket you are purchasing! There are so many variables, ranging from single day tickets for one park, multi-day single-park use tickets, and multi-park tickets that offer admission to more than one park for a specified number of days. If you are visiting a specific area, such as Orlando or Los Angeles, and you want to see a variety of parks and attractions over the course of you stay, check into special tickets, such as City Pass or SmartDestinations, which offer discounted rates for a number of different places. These passes are a bit different than the aforementioned combination tickets available directly from the location as they often offer a broader range of attractions from which to choose that are not typically associated. This can be a wonderfully economical way of visiting a larger area. As always, carefully check for any restrictions, particularly around the holidays. Visitor centers and convention bureaus are always a great place to look for deals and to make sure that the sites you are using are legitimate. VisitOrlando.com, the city's official visitor website, and VisitSanDiego.com, the official website for the San Diego Convention Center are two great examples. Almost anywhere you may be looking to travel will have an organization with direct ties to the city or region and can be a wealth of information for anyone either new or residing in the area not only about the attractions themselves, but hotels, motels, general travel to the area, restaurants, and so much more. Many will be happy to send out complete packets of information, too, either via email or post, so it is an excellent resource and sometimes one of the best ways to discover how to get the most value for your money. 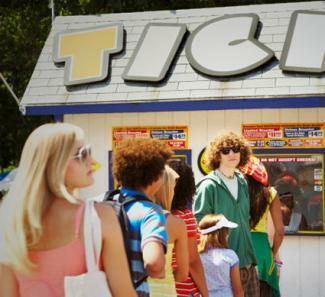 Regions with large, popular amusement parks often have discount ticket dealers who buy tickets in bulk and resell them to the public at a lower price than at the park gate. There are a number of great examples for the Orlando, Florida region, including Park-Tickets.com, an authorized dealer for Orlando attractions that will deliver real tickets (not vouchers) and Orlando Fun Tickets that, in addition to regular park tickets, also has access to amenities such as My Magic+, Fast Pass, and RFID bands. There are also multiple websites that cater to both coasts and the middle of the country for areas like Branson, MO, Wisconsin Dells, WI, and Nashville, TN, that have many wonderful attractions condensed into a single area. Sites like Mousesavers.com, Undercovertourist.com and Welcome to SoCal (which includes links to some great mobile apps to enhance your visit) provide these services and lots of great tips for how to make the most of your park visit. Nationwide discount travel sites like Expedia also sell tickets to some parks. When purchasing online, be cautious to ensure the deal is not too good to be true. Caution: Protect yourself against scams when purchasing tickets online. Be sure to find authorized vendors who are either connected to or recommended by area convention centers, visitor bureaus, and chambers of commerce as they will have been vetted properly. Companies with high-dollar products and services to sell sometimes give away free theme park tickets in exchange for attending marketing demonstrations or tours. This is a common promotion for time share companies. If you opt for this route, be aware that you're likely to spend quite a bit of your vacation time listing to a high-pressure sales presentation. It can be a good idea if you are actually interested in what the company is selling, but may not be the best use of your time if you are not. Large parks like such as Disney Parks & Resorts, Universal Studios, or Six Flags, will make public announcements about price changes. Two things happen in these instances; first, the other parks in the area follow whatever trend is happening, typically by raising their own prices, or, secondly, they create a special promotion to encourage people to buy tickets. While the latter does not happen as frequently as the former, if you are planning a park visit after the time these changes are implemented, you may want to hunt quickly for deals and purchase prior to the increase. Finding the best possible deal on amusement park tickets can turn an otherwise expensive vacation into an affordable getaway. By investigating different available discounts and comparing deals from a variety of sources, park guests can find great bargains easily. A little homework can go a long way toward making the most of your vacation budget without breaking the bank and still getting to see and do everything on your wish list.